This Chicken coconut rice bowl was inspired by a dish I had up in Canada just a couple weeks ago. I love the different nutrition variety on one plate. Grapefruits have been in my everyday life lately, and I thought it would be a great addition to the rice, which worked out very well (plus, I like how grapefruits are great for clearer skin). I tried this recipe with white rice and brown rice, and can tell you that either one works with the flavor of the coconut. Coconut is essential for improving the digestion. It also regulates thyroid function and improves brain function. Because of its anti-viral, anti-bacterial, anti-fungal, and anti-parasite properties, the flesh, water, and oil of coconuts support the immune system. It also good for the absorption of nutrients, vitamins and minerals. There are so many health benefits in coconuts that it is known as the 'tree of life'! The rice in this recipe supports your heart health while the chicken provides your body with daily lean protein. Dairy-Free Coconut Ranch: Combine ingredients into a small blender and blend together till smooth. Coconut Rice: Rinse rice in cold water. Place in a small saucepan with coconut milk, water and a pinch of salt. Bring to a boil on medium-high heat. Stir and reduce heat to the lowest. Cover the pan with a lid. Continue cooking for 15 minutes. Remove the pan form heat and let it cool down for 5 minutes. Fluff with a fork. Chicken: Sprinkle both sides of the chicken with 1/2 teaspoon salt and 1/2 ground black pepper. Heat up 2 Tablespoons olive oil in a skillet then place the chicken in the skillet. Cook until the meat is no longer pink and the juices run clear. This should take 8 to 12 minutes. As the chicken cooks, turn it occasionally. Take out and let cool, then cut. 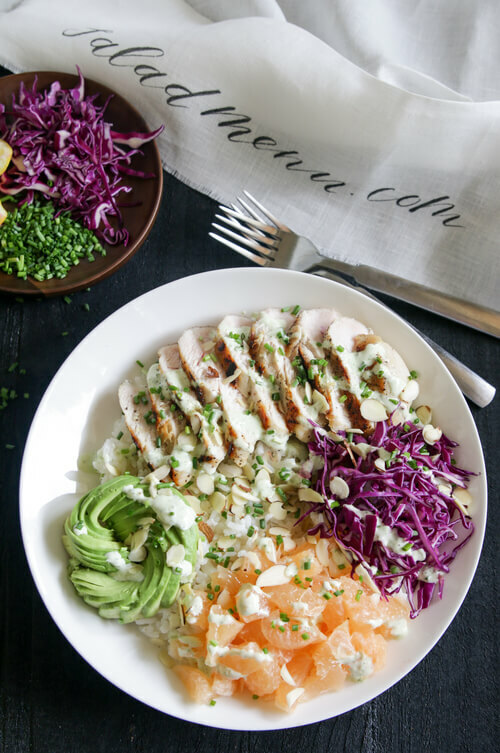 Arrange: Add the rice, chicken slices, avocado, red cabbage, and grapefruit. Sprinkle with chives and sliced almonds.